So I’ve still yet to really dive into Mega Man 11 myself. I beat two Robot Masters but it got sidelined in favor of Assassin’s Creed Odyssey and other games last fall. However, that doesn’t stop Tundra Man from being one of my favorite Robot Masters just because of how superbly designed he is and how much of a ham he is when you fight him in battle. Like, look at the guy. He’s a figure skater (which is one of those things that fit so well I’m honestly surprised they hadn’t done before) and he moves about the arena spinning and pirouetting. Three spotlights are on him at all times and all of his voice line deliveries are so flamboyantly show-offy – he’s amazing. While I have a soft spot for most of the older Mega Man games, the updated art design of 11 really gives me hope for some more amazing Robot Master designs in the future if they continue the series. Mega Man 8 is one of my least favorite games in the series, but Tengu Man has always been one of my favorite Robot Masters. Like Tundra Man, his design is unique and taps into Japanese mythology – and as I might have mentioned before, I’m a huge fan of all kinds of mythology and mythological creatures. Unlike the pretty bland Centaur Man, though, Tengu Man has a lot of personality behind his overall look and left an indelible impression on my mind when I was younger. His vocals are also a blast during the fight with him. Between the almost ambivalently delivered “Tornado Hold!” and the nonsensical “Here You Go!” he shouts whenever he dives at you, the sarcastic-sounding bird-man almost immediately became my favorite Robot Master in MM8’s train of really weirdly vocalized robots. He was a shining point in an otherwise meh game and I was happy he was chosen to be one of the repeat bosses in Mega Man & Bass. 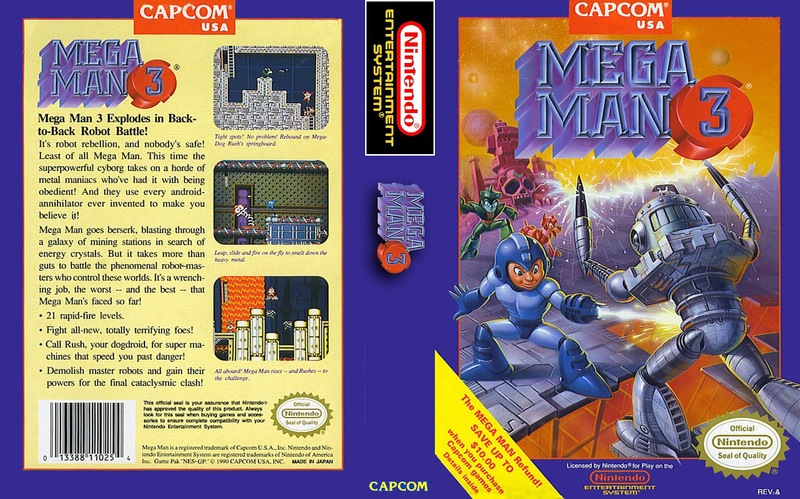 Almost every Mega Man game has a Robot Master that’s designed in this weird yet readily identifiable way – a robot that has its torso also functioning as its head. Needle Man, Toad Man, Blizzard Man…but then there’s my personal favorite of this design – Napalm Man. I really like the random purple color he has as well as just how freaking weird everything about him is. He has treads for feet – so he’s kind of a tank? But when you fight him he literally only jumps around to move so what the heck are the treads for? And what the heck are his hands? Are they self-reloading rocket launchers? And is that another rocket on his head or is that a jet engine? Why not throw in even more rockets on his shoulders – WHERE IS HE STORING ALL THESE ROCKETS? And is his stage supposed to be…Vietnam? What? Did they really go there in this game? I love the entire absurdity of Napalm Man’s existence, not too many Robot Masters can top him. Okay, I was trying to write up interesting stuff for each Robot Master but there isn’t really much to say about Spark Man other than look! HE’S A GIANT SPARK PLUG! Like c’mon that’s just top tier design all by itself, how can you NOT love this guy? On top of that his eyes bug out every time he throws a giant spark at you like he’s surprised he’s attacking. On top of that I love his stage’s theme music and you get to see how crazy he would look with a realistic bend thanks to the game’s cover. What’s not to love about this silly lil’ robot? So Mega Man 3 is by and large my favorite Mega Man game, so it’s no surprise that my top 2 favorite Robot Masters both come from this game. In fact, Shadow Man and Snake Man both probably would have made the cut as well if I did a top 10. But Top Man is the overall greatest Robot Master ever in my mind. First, I love his stage’s music. Robot Masters are almost always tied to their stage themes in my mind so the fact that Top Man’s theme is one of my favorite Mega Man themes of all-time is many points in his favor. But beyond that, he’s so freaking dumb. He’s TOP MAN! All he does is throw tops at you and spin! How was this goofy idiot threatening at all?! How in the world did Dr. Wily look at this creation and go “Yes, this will strike fear into the hearts of men!” But look how cocky and smooth he thinks he is in that official art! It’s so hilarious. AND you get what is regarded as one of the worst abilities in the entire series from him: the Top Spin! It’s a move that lets you…spin while you jump! It is miserable and not an effective attack at all – it gets used up so quickly and barely has any range. And yet….it is the only weapon that works against the final boss of the game. So it turns out…Top Man is actually the strongest of them all! God I love Top Man. What a ridiculously stupid but fun design for a boss. And that’s it for Mega Man Robot Masters. At least until next week…when I’ll be talking about the top 5 WORST Robot Masters in the Mega Man series! That’s right, this is a Top 5 Two-Parter! Whooooaaaaaaa. I’m so full of twists….you could call me Top Man! Okay, I’m just gonna go now. See you all next week!